Two men have been arrested in connection with the death of a 91-year-old woman in Ayrshire. Elderly Margaret Irvine was found dead at her home in Galston last month. Strathclyde Police confirmed that two men, aged 34 and 39, have been arrested and are detained in police custody in connection with the death. A report will be sent to the Procurator Fiscal and the pair are expected to appear at Kilmarnock Sheriff Court on Monday. 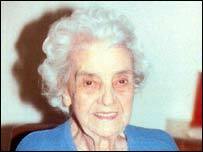 The great-grandmother was found dead in her Barwood Road home in Galston, Ayrshire on Sunday, 28 September .